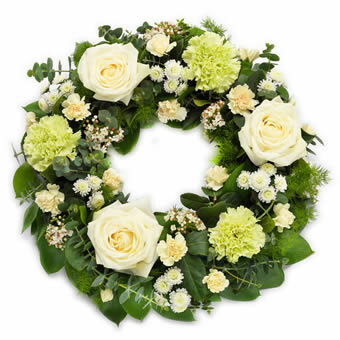 Show your deepest sympathy and love with this white funeral wreath. It contains typically fresh flowers like roses, chrysanthemum, carnations, viburnum, and seasonal greenery. A local florist will prepare this tasteful funeral wreath which will be personally delivered. Service fee from € 8.95. You can select a funeral ribbon or condolence card in the order process and you can add a personal text at the checkout.